A mock interview event for Grace College juniors and seniors was hosted recently by the Center for Career Connections at Grace College. 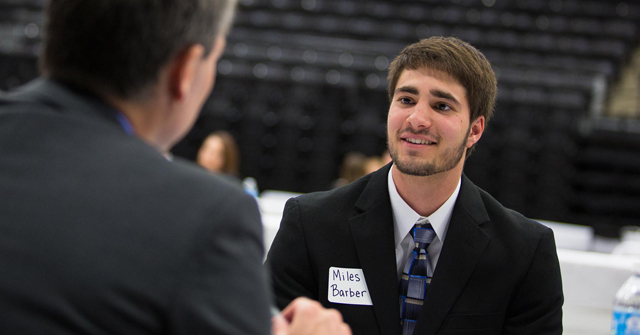 On Wednesday, April 16, more than 50 Kosciusko County employers gathered at the Manahan Orthopaedic Capital Center to give students an opportunity to practice their interview skills. Set up in “speed dating” style, mock interviews were conducted in two shifts with a networking session and dinner in between sessions. Freshmen and sophomores from the Millennial Scholar Academy and the Orthopaedic Scholar Institute were also privileged to attend. Participating employers included: 1st Source Bank, ABC Industries, Best Schotz Productions, Big Brother/Big Sister, Biomet, Brandpoet, Cardinal Services, Center Street Partners, Kosciusko/Warsaw Chamber of Commerce, the City of Warsaw, Crowe Horwath, DePuy, Egg Innovations, EnPak, Grace College, Grace Village Retirement Community, Hand Industries, Harrison Elementary, Helvey and Associates, Jefferson Elementary, Lake City Bank, Leesburg Elementary, Louis Dreyfus, Maple Leaf Farms, Pierceton Elementary, Royal Blue, Smith Academy for Excellence, Silveus Insurance, Spherion Staffing Services, Star Bank, SYM Financial, Tree of Life Bookstore, uLead, United States Army, Warsaw Community Schools, Winona Lake Police Department, Winona Lake Grace Brethren Church, Zimmer, and Zing! Recruiting.